Although we can’t yet compete with world heavyweights America, Australia’s basketball prowess is growing. Proof of this is in the fact that NBA recruiters are continually looking to Australian players to draft – many of which have gone on to become superstars in recent years. However, what people don’t realise is that Australia also has a large presence on the world wheelchair basketball scene. They have fielded a team in every Paralympic games since 1968, and have regularly finished high in the standings. In the last 6 Paralympic games, the Australian men’s team has performed exceptionally well, taking home two gold and two silver medals. Wheelchair basketball is a sport played by people with various physical disabilities which prevent them from playing regular sports. Most of these people have difficulty or are unable to walk, which leads to the sport being played in wheelchairs. It’s rules and regulations are governed worldwide by the International Wheelchair Basketball Federation (IWBF), which ensures fair play and that people with unfair advantages or without disability don’t take part in high level events. 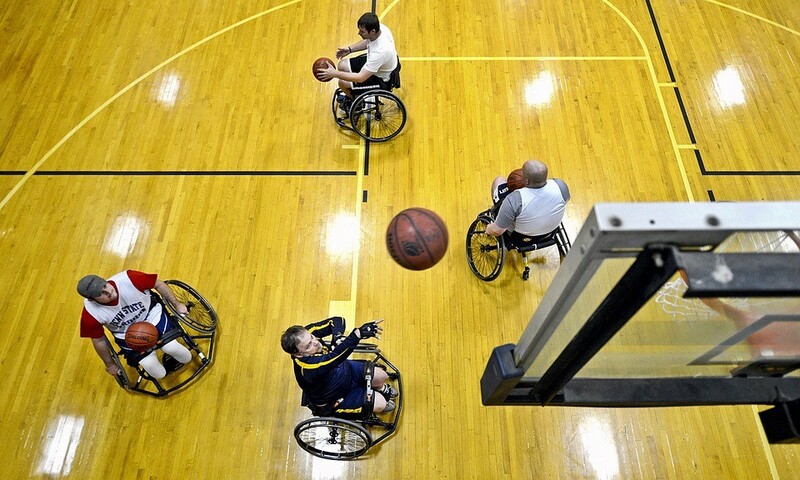 It is estimated that more than 100,000 people play wheelchair basketball across the world. This number is made up of players from the 82 countries with National Organisations for Wheelchair Basketball. People of all skill levels and from all walks of life take part in the sport, with competition levels ranging from recreational and social games to professional leagues. In some countries, including Australia, non-disabled athletes are allowed to use wheelchairs to compete alongside their disabled counterparts in lower level competitions. A travel is defined as when a player touches their wheels more than twice after receiving or dribbling the ball. Some fouls are different to standard basketball, including hooking (hooking someone’s chair and causing them to lose control) and lifting (lifting your chair while in possession of the ball). However, it is important to note that things such as court size and the height of the net remain unchanged. Wheelchair basketball is notable due to the fact that it is one of the fastest growing sports in the world, and the fastest growing for athletes with a disability. Australia boasts a lot of international success in the sport, and is definitely one of the world leaders. The National Wheelchair Basketball League (NWBL) is Australia’s premier competition for wheelchair basketballers. The National Wheelchair Basketball League, or the NWBL, is Australia’s top-level men’s wheelchair basketball competition. It is composed of players from across Australia who compete for the title during an 18 game season. There are currently six teams in the league from five states, with games played across the country. The 2016 champions were the Be Active Perth Wheelcats. The Women‘s National Wheelchair Basketball League is very similar to the NWBL. It is also played Australia wide, with five teams coming together for a 16 game competition played across the country. The most recent WNWBL champions are also from WA, with the Be Active Western Stars winning the 2016 competition. The Rollers are currently one of the world’s top male wheelchair basketball teams. The have performed extremely well in international competitions since the mid 1990’s. Their most notable performance was the gold medal in the 1996 Paralympic Games, which were held in the USA. As well as this, the Rollers also won gold in 2008, backed up with the silver medal in 2004 and 2012. They fell away a little in 2016, finishing 6th. However, they still recorded 5 wins and just 2 losses. They have also performed very well at recent World Championships, finishing 3rd in 2006 and winning the gold medal in 2010 and 2014. The Gliders are Australia’s premier women’s wheelchair basketball team. They represent Australia in all international competitions, and have done since the early 1990’s. Since the year 2000 the Gliders have had a mixed run at the Paralympic games. They won the silver medal in 2000, 2004, and 2012, along with the bronze medal in 2008. However, they failed to qualify for the 2016 games after finishing 6th at the 2014 world championships. The Gliders have traditionally done ok at the world championships. They competed for the first time in 1994, coming away with the bronze medal. They backed this up with two more 3rd place finishes in 1998 and 2002, but slowly dropped away after that to finish 4th in 2006 and 2010 and 6th in 2014. If you are interested in playing wheelchair basketball, then the best thing to do is to get in touch with your local wheelchair sports association. They will be able to tell you when and where the next competitions or leagues take place. Contact details for the relevant state associations can be found here.